Well Dressed Tables rental data shows that interest in gold chair rentals, china, and other pieces will trend up in December and January. To help you host a holiday event that’s as good as gold, Well Dressed Tables put together our most popular gold rentals – including 2 brand-new pieces! For more design ideas, head over to our Look Book. 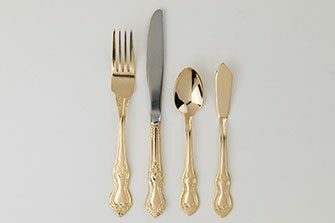 The Royal Gold flatware is a superb vintage-inspired set. 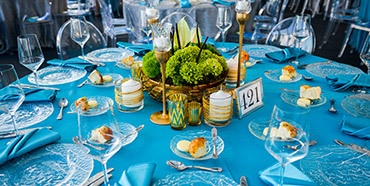 To add complexity to each place setting, gorgeous designs adorn each handle. The serrated knife also has a silver blade, which makes the whole set a cut above the rest. 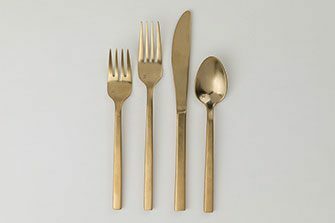 Thanks to a brushed gold finish, Gold Titan Arezzo flatware is modern and geometric but brings warmth to the table. Look closely – and you’ll see that the Gold Titan Arezzo set complements colors across the spectrum. 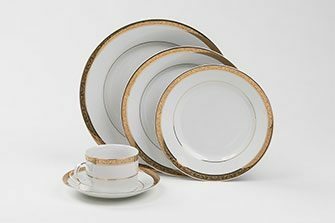 With a dazzling patterned edge, the Paradise Rim china set will bring early 20th century glamour to your event. It’s inspired by a Lenox china set that was originally introduced in 1917, giving our Paradise Rim design an unmistakably classic look. 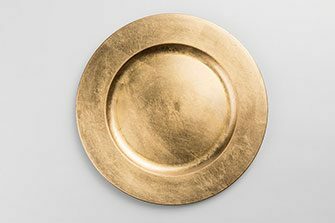 The Gold Charger is a piece with cool contemporary style – but the plate’s worn texture helps bring a softer look to each table. The simple design means our Gold Charger works well with nearly all gold or ivory china in the Well Dressed Tables collection. 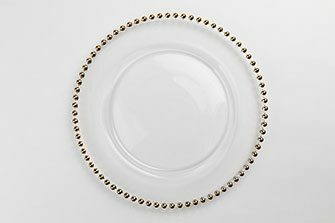 When a plate is set on the Gold Bead charger, only the playful rim is exposed, creating great visual interest on the table. The look is both whimsical and stylish – and might remind guests of Christmas ornaments. 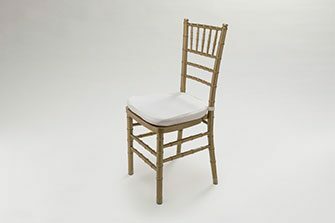 Chiavari chairs are the “chameleon” of chair rentals. They work well at any event – high-society gala event to a casual but elegant reception. You simply can’t go wrong with a Gold Chiavari chair. Just use an Ivory seat cushion to complete the look. Reserve Holiday Party Rentals Now: Book rentals for Christmas and New Year’s events well in advance to lock in what you need!